Leather vs Fabric Chairs | Which one is Best for You? HomeComfort Corner LifestyleThe leather or fabric debate: which one is best for you? The leather or fabric debate: which one is best for you? It doesn’t matter whether you’re investing in a chair or sofa, the important thing to consider is choosing the right piece of furniture. To do this, you’ll need to deliberate on the size of the chair to ensure you have correct posture, the shape to ensure exceptional comfort and the style to ensure the new piece matches your existing décor. However, one thing that many overlook is the classic leather Vs fabric debate. As the chair specialists, we are here to help you decide whether material or leather is best for your circumstances with this useful advantages and disadvantages guide. First of all, it is important to say that here at HSL both of our leather and fabric chairs are comfortable; it’s what we pride ourselves on! However, when it comes to comfort, it is often important to establish exactly what you want from your chair. For example, some people absolutely love the sinking, cosy feeling that comes with fabric. Others prefer the firm, supportive nature of leather when they sit down for a long period of time. Having said this, if we had to measure the leather vs fabric debate solely on comfort then we would say, along with many other people, that fabric triumphs but again it is important to note that everyone is different. Another important factor to consider when deciding on fabric or leather is the maintenance and durability of the chair. With fabric chairs there will inevitably be a lifespan but this shouldn’t matter too much if the chair is made from good quality materials. In addition, both fabric and leather chairs can come with cleaning solutions, ensuring maintenance becomes easier. Similarly, most spills can come out of a fabric product with the correct care and attention but on occasion a tough mark will prove hard to get rid of. On the other hand, leather furniture is more susceptible to scratches and humidity than their fabric counterparts. Therefore, leather may not be the best option for those with pets. It is also worth considering that leather is much easier to clean than fabric, where only light dusting is required. In addition, leather is an extremely robust material which actually gets better with age. Areas that look warn can simply add character to the chair. 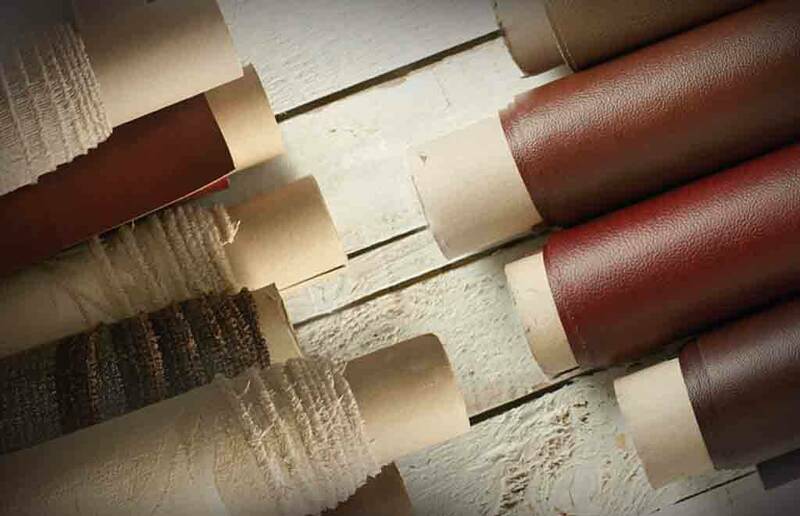 For these reasons, we think that leather wins on maintenance and durability. It goes without saying that if you’re buying a chair or sofa, you want it to be comfortable but also stylish! A leather chair inevitably has a touch of elegance and sophistication with a sleek and classic appearance. However, fabrics are usually more plentiful and as such can be more adaptable to your existing décor. We believe that fabrics are the best choice if you have a certain colour scheme around the house but if you have a neutral décor then leather is just as good. You can’t really put a price on a fantastic, handcrafted piece of furniture but if cost is a consideration then it will be important to assess the model that best suits your needs. Once this is established, fabrics are normally cheaper than leathers. Therefore, if you have a smaller budget, fabric is usually the best option. This is an unusual factor to bring into a fabric vs leather debate but it is one that is worth bearing in mind. For example, if you suffer from allergies then, fabric tends to absorb more allergens, meaning that leather is the best option. Similarly, if you are more concerned about having the confidence of staying in your chair, then due to the texture fabric may be a safer option. Ultimately, this will depend on your own personal preference. The final feature to cover is again one that is not usually considered when buying a chair. However, if a leather chair is left in sunlight for any significant amount of time it will heat up and you should take caution when sitting to ensure that it is not too hot. In addition, in winter months leather can become increasingly cold, especially if you have not sat in your chair for a long period of time. For a more constant temperature throughout the year, it is best to opt to have your furniture in fabric. Having discussed the pros and cons of having both a fabric and leather chair, which one should you pick? Ultimately, this will come down to a combination of factors. For some comfort will be the deciding consideration, for others style and maintenance will be important. The best thing to do is decide what is most important and least important to you and work from there.